A personal fitness trainer can provide a very valuable service to people who need a specifically tailored exercise program to help maintain their strength, fitness, and longevity! Lets examine the personal trainer certification, what these trainers do, how to find personal trainers and also the option of online personal fitness training. This depends on your goals and budget. Some people can’t afford these services, but for those that can, they can help get you over that hump of not being able to stick to an exercise program. A good trainer can start you on your way to becoming fitter and healthier. If you find you just do not have the motivation to stick to an exercise program, or you just don’t know what to do or how to do it, you can benefit from the services of a trainer provided you can afford it. Generally trainers charge between $25 per hour on the low end to $50 to $75 dollars per hour on the higher end. The top trainers out there who work with celebrities often charge hundreds of dollars per hour, mostly because they train famous people. While paying more will not necessarily get you a better trainer, the better qualified ones can charge more if they have experience and some upscale or higher profile clients. He will obviously have to show results for what he is paid, as even wealthy people expect results when they pay top dollar. Trainers should have the minimal credentials that indicate they have mastered the knowledge necessary to train a healthy individual effectively. Most trainers will have a personal trainer certification through one of several organizations that provide certification programs and testing. You will also want to inquire into whether the fitness trainer you choose is insured for liability and has been certified in CPR. A certification in or thorough knowledge of first aid would also be desirable. The certifying organizations also require continuing education hours, or CEU’s that the trainer must complete to stay current with the latest knowledge in his field and retain his personal trainer certification. Some trainers work online, which means that they provide personalized fitness and nutrition program remotely and do not actually guide you through every workout. For people who are comfortable enough exercising alone, this may work well. You would have to know and understand how the exercises should be performed and also have the motivation to get to the gym and do what is necessary to continue to make progress. These trainers may or may not be certified, but ideally you should find one who is. The cost for being trained by one of these online trainers tends to be considerably less, because they are not being paid for training hours they spend with you. Thus their rates should be much less than the $50-$75 that regular trainers charge. They may even charge a flat fee for creating a program, and perhaps a recurring fee for email or phone consultation. If you feel that you need a structured exercise program for health or fitness reasons and know that you either cannot or will not do it on your own, then you should invest in the services of a trainer. Remember that the trainer is there to guide and instruct you, but the effort and persistence to make things happen rests with you. Make sure the person you select has the proper personal training certification, and that you feel comfortable working with him or her. Remember also that online personal fitness training is not for beginners, as you need to have some experience with exercise. 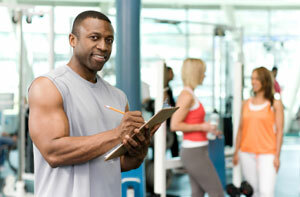 If you are completely new, stick with the services of a personal fitness trainer. Your health and appearance are well worth the extra money.